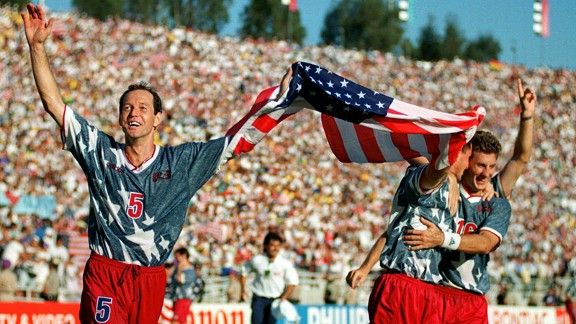 Our series on the US at the World Cup continues with part seven, a look at the 1994 World Cup, the only time the US hosted the tournament. Player development in the US after the 1990 World Cup continued to be hampered by the lack of a viable professional league. Those who could went to teams in Europe. Those who couldn’t continued with the USSF grant program first established in 1988 or with indoor or semi-professional clubs. The national team itself soon embarked on what was to be a very crowded international schedule. Meanwhile, the federation was undergoing a rapid period of development of its own. Two months after the 1990 World Cup, the presidency of the USSF was up for re-election. Then-president Werner Fricker, the Yugoslavia-born Philadelphian who won the National Amateur Cup in 1965 with Philadelphia’s United German Hungarians and had been on the 1964 US Olympic squad, had led the federation’s efforts to host the 1994 World Cup. But he had disappointing success in selling the event to corporate America. FIFA had chosen the US to host in large part because it was hoped that the huge profits generated by the 1984 Olympics could be duplicated and was far from pleased. Additionally, some in the US soccer community viewed Fricker as aloof. By the time of the 1990 election, Fricker had fallen out of favor with many of the state and regional soccer associations. Never before had a single event so effectively unified the disparate strands of the country’s soccer community: immigrant fans, soccer moms and dads, wistful NASL devotees, college and high school coaches, and all those millions of youngsters. The World Cup had never seen such numbers. The 1994 World Cup would be staged in nine stadiums across the US: Foxboro Stadium in Massachusetts, Giants Stadium in East Rutherford, New Jersey, RFK Stadium in Washington DC, the Citrus Bowl in Orlando, Florida, the Pontiac Silverdome in Michigan, Soldier Field in Chicago, the Cotton Bowl in Dallas, Texas, Stanford Stadium in California, and at the Rose Bowl in Pasadena, California, site of the final. Rothenberg’s election was followed by the appointment of Serbian-born Bora Milutinovic as coach of the national team. Milutinovic had coached Mexico to the quarterfinals in the 1986 World Cup and Costa Rica to the second round in 1990. His coaching style—show the players what you want to do by playing along side them in practice and keep the game simple—helped to transform the team, as did a grueling schedule of international matches which included winning the inaugural Gold Cup in 1991, the first major tournament ever won by the national team. The expanded schedule of games to ensure the national team would see regular playing time in a competitive environment continued after the Gold Cup win, made all the more important since, as host country for the 1994 World Cup, the US would not participate in CONCACAF’s qualification tournament. In 1991, the national team played 18 international games. In 1992, the team played 21 internationals. In 1993, the number of internationals rose to 34. The team’s performance in all these internationals in terms of was decidedly mixed. Of the 34 games played in 1993, 24 were played at home for a 9-7-8 record; playing away from the US, the team’s record in 1993 was 2-6-9. Interestingly, the first US win of the year came on the road with the 2-0 win over Saudi Arabia on April 9, its tenth game of the year. The US wouldn’t get its first win at home until its 16th game of the year, the eleventh at home, when it defeated England 2-0 with goals from Tom Dooley and Alexi Lalas on June 9 in front of 37,652 spectators at Foxboro Stadium. The game was part of the US Cup series that included a 2-0 loss to Brazil on June 6 at the Yale Bowl and a 4-3 loss to Germany at Soldier Field in Chicago on June 13 (Jurgen Klinsmann scored the opening goal in the 14th minute). It was the first US win over England since the 1950 World Cup. One week after its win over England, the US began its short run at the Copa America in Ecuador where it lost 1-0 to Uruguay on June 16 at Estadio Bellavista in Ambato, then lost 2-0 to Ecuador on June 22 at Estadio Olímpico Atahualpa in Quito. The team played its final game of the tournament at the same stadium on June 22, a 3-3 draw with Venezuela that included three goals from Chris Henderson, Alexi Lalas, and Dominic Kinnear. Venezuela scored the equalizer in the 89th minute. A little more than two weeks later, the US was back on home soil for the 1993 Gold Cup tournament where the team went undefeated in its group games, all of which were played at the Cotton Bowl. On July 10, the US defeated Jamaica 1-0 in front of a meager 11,642 spectators thanks to a goal from Eric Wynalda. On July 14, the US defeated Panama 2-1 in front of 13,771 spectators with goals from Wynalda and Dooley. 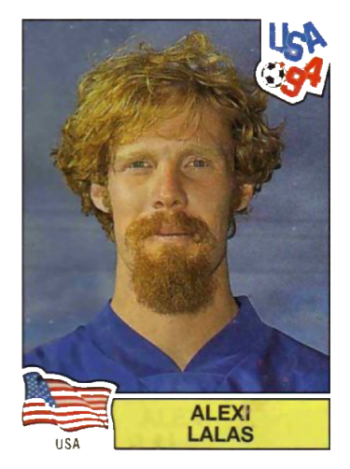 On July 17, an Alexi Lalas goal saw the US close out group play with a 1-0 win over Honduras in front of 16,348 spectators. The US then squeezed past Costa Rica in front of 14,826 spectators in the July 21 semifinal, which was also held at the Cotton Bowl, with a goal in the 103rd minute from Cle Kooiman for a 1-0 win to advance the finals where it would meet Mexico. But, whereas all of its group games had taken place in front of sparse crowds at the Cotton Bowl, the team would have to play Mexico at the Azteca. There they lost 4-0 in front of 120,000 spectators on July 25. 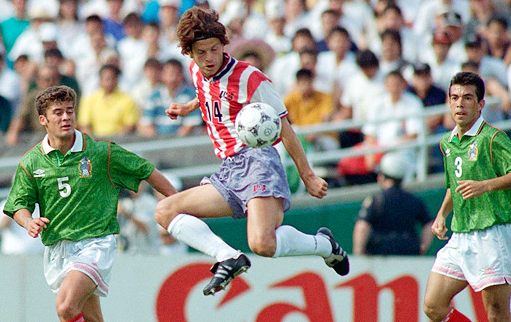 The US would finish out the final nine games of 1993 — including a 1-1 draw with Mexico at RFK thanks to an 82nd minute equalizer from Cobi Jones on October 13 and a 1-0 loss to Ukraine on October 23 at Goodman Stadium in Bethlehem, Pa., in front of 7,896 spectators — with a 4-4-1 record. Of the wins, one was a 1-0 away win over Iceland on August 31, one was an 8-1 blowout over the Cayman Islands on November 14, and another was a 7-0 stomping of El Salvador on December 5. The last game of the year was a 3-0 loss to Germany at Stanford on December 18. In the five months before the 1994 World Cup, the US played 18 games against international competition. Only two of the games were played outside of the US and both were losses at the Carlsberg Cup in Hong Kong, a 0-0 (2-4 APK) loss to Denmark on February 10, 1994, and a 2-1 loss to Romania on February 13. It was an up-and-down series of games in which the US finished with a 5-5-8 record. Attendance was also up-and-down, with 43,651 spectators on hand to see the team draw 1-1 with Russia at Seattle’s Kingdome on January 29, and 2,158 in attendance for the 4-0 win over Estonia on May 7 at Fullerton Stadium, not far from the team’s Mission Viejo base. But the win over Estonia — which included goals from Frank Klopas, Claudio Reyna, Marcelo Balboa, and Joe-Max Moore, and came a week after a 2-0 loss to Chile in Albuquerque on April 30 — marked the beginning of some positive momentum before the start of the World Cup. On May 15, the US defeated Armenia 1-0 with a goal from Klopas at Fullerton Stadium. After drawing 0-0 with Saudi Arabia in Piscataway, New Jersey on May 25, the US drew 1-1 with Greece in New Haven on May 28 with another Klopas goal. On June 4, the US defeated Mexico 1-0 in front of 91,123 spectators at the Rose Bowl. Roy Wegerle scored the winner. While the results from the 52 games played in the year and a half before the 1994 World Cup may have been mixed, the experience gained by the team was invaluable. In the course of that heavy schedule, the US played 13 of the 24 teams that would appear in the 1994 tournament. Throughout the run-up to the Cup he served as a lightning rod not only for the growing skepticism about his team’s chances but also for his players’ anxieties. This allowed them to develop a self-confidence out of all proportion to their international reputation and, probably, their ability. “With Bora, everything is possible,” says U.S. assistant coach Steve Sampson. Indeed, every lineup is possible, every tactic—and, ultimately, every result. When it came time for his final roster selection, gone were veterans of the 1990 team like Desmond Armstrong, John Doyle, Kasey Keller, Bruce Murray, and Peter Vermes. In the end, Milutinovic included only six members from the 1990 team: Tony Meola, Marcelo Baloa, and Paul Caligiuri, as well as John Harkes, Tab Ramos and Eric Wynalda, who were among the seven foreign-based players who joined the team at the US camp three weeks before the start of the World Cup finals. On the squad were players whose names would soon be familiar to US soccer fans, players like Tom Dooley, Earnie Stewart, Cobi Jones, Joe-Max Moore, Frank Klopas, Mike Sorber, Brad Friedel, and Alexi Lalas. Claudio Reyna was also named to the final World Cup roster but would miss the tournament after a hamstring injury only days before the start of group play. The more cynical of observers assumed the US would get an easy draw. While FIFA was kind enough to grant the US one of its top six seeds, the teams drawn with it in Group A — Colombia, Romania and Switzerland — were anything but pushovers. They were also all teams that the US had played in the year-and-a-half before the start of the tournament. The first match for the US was on June 18, 1994 against Switzerland and was played at, of all places, the Pontiac Silverdome on a temporary grass pitch. The first match in World Cup history to be played indoors, the stadium had been designed to keep the winter out and was not equipped with air conditioning. The stifling heat did nothing to dampen the enthusiasm of the more than 73,000 people on hand to see the match who proceeded to produce a level of partisan support probably never before experienced by a US team. Despite the noise, Switzerland, with whom the US had drawn 1-1 on January 22, 1994, scored first on a free kick from Georges Bregy and suddenly the US were faced with the possibility that their hope to make it to the second round would be quashed by perhaps the weakest team in the group. Then, in the 45th minute, Eric Wynalda leveled the score with a stunning free kick. While the Swiss controlled play for long stretches in the second half, both sides wilted in the hot and humid conditions. The match ended as a 1-1 draw and the hopes of the US were still alive. It was the first point earned by the US in a World Cup since its defeat of England in 1950. Four days later on June 22, the US faced Colombia in front of 93,000 at the Rose Bowl where, only 18 days before, they had defeated Mexico. Colombia was viewed by many as one of the tournament’s contenders but they had lost their first match to Romania, 3-1. Colombia, who had defeated the US 2-1 when the teams last met on May 8, 1993, controlled play in the early stages of the match against the US. 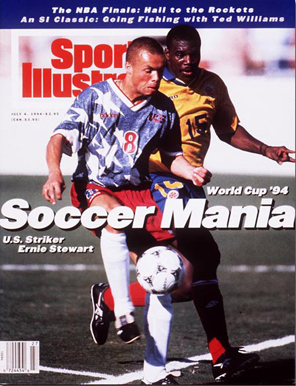 Momentum was shifting to the US when in the 34th minute a low cross from John Harkes intended for Earnie Stewart resulted in own goal by Colombian defender Andres Escobar. In the 52nd minute, Tab Ramos lifted the ball over the Colombian defense to the feet of Stewart, who put the ball past the keeper for the second goal of the match. Adolfo Valencia got a goal back for the Colombians in the 89th minute but it was too little too late. While many were quick to proclaim the victory as some kind of “miracle on the grass,” others wondered if perhaps the Colombians were guilty of believing too much the hype that had surrounded the team going into the World Cup. Whatever the case, it was an important upset: the US hopes were still alive while Colombia’s World Cup hopes were over. On July 2, Andres Escobar, who was known by the nickname “El Caballero del Futbol” — “The Gentelman of Football” or “Football’s Knight” — was shot twelve times outside of a bar in a Medellin suburb, presumably at the direction of gambling syndicates who had lost money on the USA-Colombia match. The killer reportedly shouted “Goal!” before each shot. On June 26, the US faced Romania, again at the Rose Bowl, needing only one point to secure a spot in the second round. But the US was undone by Romania’s greater experience and tactical discipline. Roger Allaway and Colin Jose note in The United States Tackles the World Cup that the counterattacking style of the Romanians was idea for the scorching conditions: 101 degrees for the 93,869 spectators in the stands, 120 degrees for the 22 players on the pitch. Dan Petrescu’s strike in the 19th minute proved to be enough to best the US and the match ended 1-0. Romania and Switzerland advanced to the next round as first and second place finishers in the group. The US still had a chance to advance if its four points proved to be enough to place it among the top four third place finishers of the group stage. It took two days to find out, but the US finished in the top four and would next face Brazil in the Round of 16. 84,000 were on hand at Stanford Stadium for the game on July 4, joined by some 28 million television viewers. Although the final scoreline was only 1-0, Brazil controlled play for the entire match and the US was unable to muster a single shot on goal. 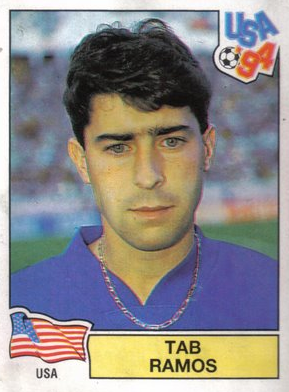 This was due in some part to the fact that two of the best US midfielders were unavailable for the match: John Harkes was suspended after receiving two yellow cards in group play, and Claudio Reyna missed the entire tournament with a hamstring injury. Tab Ramos, who had started the match, left it when Brazilian defender Leonardo elbowed him in the head and fractured his skull just before the end of the scoreless first half. Now down to ten men in the second half after Leonardo’s ejection, Brazil nevertheless continued to attack. In the 72nd minute they were rewarded when Romario found a way through the packed US defense to lay the ball off to Bebeto, who scored the only goal of the match. The US would be down to ten men after Fernando Clavijo’s ejection in the 85th minute. Minutes later, the 1994 World Cup would be over for the US. Switzerland would be knocked out of the Round of 16 by Spain, 3-0. Romania defeated Argentina 3-2 in what many considered to be the best match of the 1994 World Cup but lost to Sweden in the quarterfinals on penalty kicks after extra time. Brazil would meet Italy in front of 94,000 at the Rose Bowl in the first World Cup final to be decided by penalty kicks. When an injured Roberto Baggio missed for Italy, Brazil would lift the trophy for the first time since 1970. The 1994 World Cup was a tremendous success, both for FIFA and for US soccer. Average attendance was just under 69,000 and the event would set a new record for total attendance with nearly 3.6 million going to matches, a record that still stands despite the tournament being increased from 24 to 32 teams — and from 52 to 64 matches — beginning with the 1998 World Cup. It was also the highest attended sporting event in US history. Perhaps most importantly, the US team had not embarrassed itself at home on the world stage. There were still plenty who found low scoring games boring or a final decided by penalty kicks incomprehensible. Others, thanks to an unprecedented level of television coverage, or because they were able to attend a match, found beauty and excitement in a sport, a competition, and a culture to which they had never before been exposed. Still, there was much to be learned. Perhaps spent after all the preparations for hosting the World Cup, the federation scheduled no domestic internationals in the immediate aftermath of the tournament to further capitalize on the public relations bonanza the team and the sport of soccer had enjoyed. The US team wouldn’t play again until September 7, losing 2-0 to England at Wembley Stadium. The team would lose 2-1 away to Saudi Arabia on October 19, and then be defeated 1-0 away by Trinidad & Tobago on November 19, before finally getting a 3-0 away win over Jamaica on November 22. It would finish the year with a 1-1 draw against Honduras on December 11, 1994 in front of a paltry 1,094 spectators in Fullerton, California. As more US players made their way to Europe to play, the momentum from the 1994 World Cup finally led in 1996 to the inaugural season of a viable professional league in the US, Major League Soccer. How the effect of this increase in domestic and international club experience would benefit the US at the 1998 World Cup in France was yet to be seen. First the US would have to qualify. I’m envious! I was visiting my grandmother and other relatives in Appalachian coal-mining country in Kentucky. I’m not sure if she had ever seen a soccer ball before let alone heard of the World Cup but I got everyone to watch the games. I didn’t make any converts but I certainly enjoyed myself! I’m happy you enjoyed the article. I was too young and foolish to watch then, so I’m glad to read about it. I didn’t realize that we were so bad before that year. 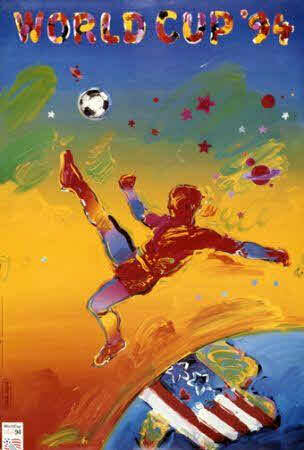 Awesome Piece, the 94 world cup is what caused me to fall in love with soccer as a young lad. I’ll never forget Eric Wynalda’s goal vs. Switzerland it’s my all time favorite World Cup Moment. That was one fantastic goal! I saw games in DC and up in New England. I still have a hat and a bunch of pins. It was a great time going to the games with the family. Never got to see the US play but it was still fun. What a great World Cup year that was – I remember the Columbia game very well. 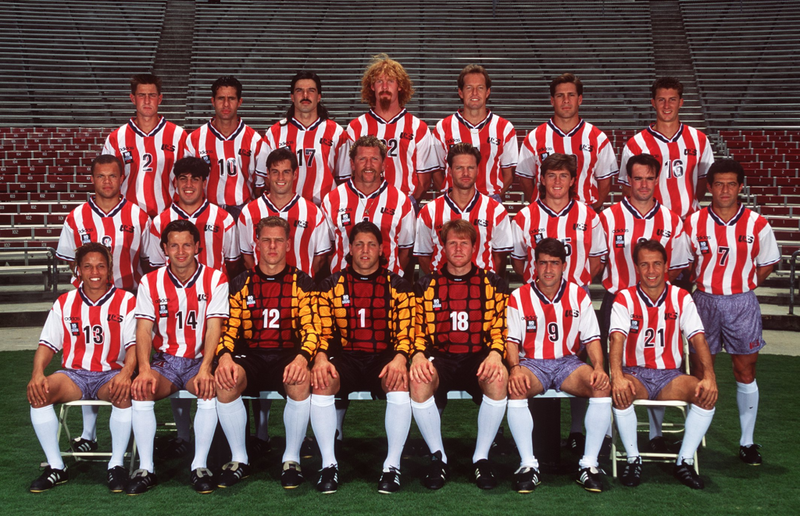 And as an added bonus, those new 2014 USMNT uniforms don’t look so bad after laying eyes on the 1994 edition again! I’m sure many of you already have, but if you haven’t… you have to watch the ESPN 30 for 30 “The Two Escobars”. Absolutely fantastic. Also the “Hillsborough” one that was just on a week or so ago, was unbelieveable too. These articles are great. Please keep em coming! I was 13 when the ’94 Cup was here and it made me love soccer more than I already did. So cool to witness it. Can’t wait till FIFA gets it’s act together and we get another one. This time I’ll be there in person! Yes, “The Two Escobars” 30 for 30 is excellent. The best one I’ve seen. I remember in the us vs. Brazil game the ball trickled very slowly parallel to the Brazil goal. All my friends were screaming waiting for someone to tap it in. Obviously didn’t happen, but it was a great moment for all of us. We sat and thought “our guys almost scored on BRAZIL!” Except for the unis, a fantastic moment. I had a blast volunteering in DC. I was part of the motor pool with my hubbie to be (that’s where we met). He drove the head FIFA guy and I got the Swiss coach’s family when they came for the quarterfinal game. I got to watch the Swiss team train and talk to the players. We got into all the games for free and it was an awesome experience! I was so hoping that the US would get 2018 or 2022 so we as a family could volunteer again. It is an experience that truly changed my life – I found a husband and started a life long passion for soccer! Just came across this, whilst having moment of boredom, browsing on Google and World Cup history. I was very lucky to have attended both of the USA’s games at the Rose Bowl, whilst I was attending a soccer camp at the time in SoCal. I’d bought more memorabilia than I care to remember, most of it still pristinely preserved and not looking 22 years old at all. The tickets are framed, the programs well kept, the clothes still fit too. Haha! Just 17 at the time, and having had a tumour removed some 6 months earlier, it was an experience I will never forget, my only regret being I wish I took more pictures (easy to say when we all have a camera on our phones these days, I guess). I fell in love with California, American Soccer and a hope that I will still one day return as a coach, to give something back. As a Brit, who’d always dreamed of visiting the US, it was something I will never forget.